When my grandpa died at 88, my grandma, then 85, was, of course, heartbroken. They had been married nearly 64 years, and she was lost without him. She moved into a retirement home, but she never connected with anyone else, and because she was increasingly forgetful, her children made the decision to take the stove out of her unit. 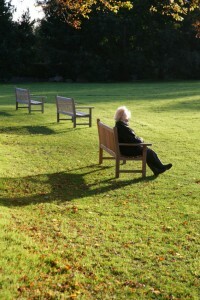 After a short while, she moved to a nursing home-type facility. Looking back now, I think she went downhill so quickly because she missed taking care of someone else and being part of a family–engrained in a family’s daily life. She thrived on caring for others, and with no one to care for, she lost her will to live. Now, 16 years after my grandpa’s death, there are plenty of housing alternatives for the elderly who prefer to stay near family and yet still maintain their own autonomy. Of course, this style of living, where three or more generations live together under one roof, is not a new concept. For generations in countries around the world families have done this. Multi-generational living is an excellent way to maintain family relationships and conserve money because more people are living in one house and sharing expenses. This arrangement, however, can cause problems in our independence driven Western culture. Only a few families are suited for this type of arrangement. Another alternative is an elder cottage. Elder cottages are small houses that can be placed in your yard, or in some cases, added on to your current home. Most elder cottages are about 600 square feet and consist of a bathroom, bedroom, kitchen and living room. These houses also contain features for the elderly including wide doorways specifically designed for wheelchair access, a kitchen that can be wheel chair accessible, raised toilet seats, and grab bars in the shower and near the toilet. These homes run approximately $33,000 for a nearly 600 square feet one bedroom home to approximately $52,000 for a nearly 1,000 square foot two bedroom home. An elder cottage would have been the perfect arrangement for my grandma after my grandpa died. She would have been immediately accessible to us and vice versa. She could have shared a large portion of her day with us and had time alone in the evenings. If your parents or grandparents require more intervention than they would receive with an elder cottage, another alternative might be the MEDCottage. MEDCottages are designed for those who have more pressing medical needs. “Using smart robotic features,” MEDCottages “can monitor vital signs, filter the air for contaminants, and communicate with the outside world very easily. Sensors alert caregivers to problems, and medication reminders are provided via computers” (MEDCottage). What happens when the need for an elder cottage or MEDCottage is gone? Elder Cottage offers a program where the home can be resold or recycled. MEDCottage can be leased for approximately $2,000 a month, so when it’s no longer needed, the lease simply expires. Another concern is that many neighborhoods may object to these types of cottages going up in backyards. Obviously, before investing money, you’ll want to check with the zoning board to make sure you’ll be able to have this type of home on your property. Not only is multi-generational living as well as the other cottages discussed a good fit for the elderly, they could also be a good fit for a disabled family member who wants independence and yet still needs regular care. As the elderly population increases, these alternatives to traditional homes or nursing homes offer families a way to stay close while also saving money, especially considering the cost of nursing home care. Have you ever tried multi-generational living? Would you buy one of these cottages for your parents to live on your property? My mom is staying with us part of the year and it’s been pretty good. A self contained unit would be a lot nicer. We’ll see what we can do.